Editor’s note: Daniel Darling is a pastor, author and speaker in the Chicago area. His latest book is "Real: Owning Your Christian Faith." He tweets at @dandarling. (CNN) - The Bible doesn’t clearly express an opinion on the possession of guns, but many evangelicals defend the unlimited distribution of firearms with the same fervor that they defend biblical orthodoxy. According to a recent Public Religion Research Institute survey, 8% of white evangelical Protestants favor tighter gun laws. In fairness to gun enthusiasts, no reasonable observer could pin the blame for the Sandy Hook Elementary School shooting solely on the lack of effective gun laws. Even President Barack Obama and other influential voices have called for a balanced approach that looks not only at guns but also at mental illness, violent video games and a culture of fatherlessness that produces young troubled men. And the research about the effectiveness of gun controls laws seems mixed at best. Still evangelicals should not defend the use, proliferation and availability of assault weapons with as much vigor as they defend their faith. In spite of some who insist the Second Amendment is drawn from the Bible, there is no clear-cut Christian position on gun control. On one level, the Bible affirms the government’s first and most basic job to protect its citizens, especially the most vulnerable, our children. Romans 13 reminds us that government is “God’s servant for our good.” The Bible also gives high priority to the welfare of children. At times, the Bible seems to affirm the right to self-defense. Even when Jesus famously told Peter to put down his sword during Jesus’ arrest in the Garden of Gethsemane, he didn’t tell Peter to destroy the sword but put it in its rightful place. On the other hand, the Scripture is pretty clear that Christians should not only oppose violence but should be advocates for the sanctity of human life. This doesn’t simply apply to abortion but to any unlawful taking of human life. Advocating for life also includes taking care of children's and others' well-being after they are born. Each life is created in the image of God; therefore, death is the work of the evil one (1 John 3:15). The Apostle Paul labels death God’s final enemy. Christians are also called to be “peacemakers” and not lovers of violence. Given the lack of a straightforward biblical imperative for or against guns, faithful followers of Christ should be more flexible in their opinions on this issue. 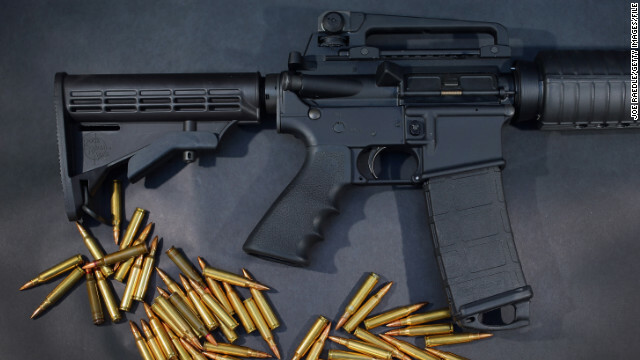 Why can’t we support sensible restrictions, such as a ban on military-style combat weapons? These weapons seem to serve no purpose other than the glorification of violence. If we take seriously the command to protect our children, we’ll avoid the risk of these weapons getting into the hands of unstable people. Sure, a ban won’t eliminate all weapons, especially those purchased illegally, but it may reduce the chance of another Sandy Hook massacre. New gun laws won’t prevent every future crime, but perhaps a few common-sense regulations would help destroy a culture of violence that so tempts young troubled men. Some will argue that new restrictions only hurt those who are already law-abiding. This may be so. But as Christians called to care for the common good of our communities, we should be willing to endure the inconvenience if it saves one child from death. Since 9/11, we have all endured more hassle at the airport to prevent even one terrorist from killing our fellow citizens. Followers of Christ know that it is ultimately not the gun that kills, but evil that resides in every human heart. And yet it is precisely this belief in total depravity that might inform our views on gun control. In a fallen world, the most vulnerable among us need protection from those who cannot or will not discern right from wrong. (Ironically, this is the focus of the Christian anti-abortion argument.) Let’s not put instruments of death so close to hands that would do evil. At the end of the day, living out our faith requires that we do more than simply react in a defensive posture but engage in this important debate. We can protect the cherished right to bear arms in self-defense and still make sure unnecessary and violent weapons are not sold on our store shelves and online and are not accessible by those in our communities who would use them to commit acts of aggression and murder. Furthermore, an unwillingness to entertain common-sense restrictions casts the evangelical faith in an unnecessarily unfavorable light. It may cause some to think we love our guns more than our neighbors. There are many things about which Christians should be unyielding; the right to own a killing machine should not be one of them. The opinions expressed in this commentary are solely those of Daniel Darling. outlet ugg nfl football jerseys cheap moncler outlet online store Wholesale Jerseys British company Costa Coffee aims to have 500 cafÃ©s in the country by 2016. Hong Kong-based Pacific Coffee is also looking to expand and overtake Starbucks on the Chinese mainland. stivali ugg moncler clearance uk 2. Research has focused on the early stages of stretch marks, when they are still red or purple and most readily respond to treatment, Baumann explains. Once stretch marks pass the initial stage, when they are red or purple, to the later stages, where they become white or silver - often with deep indentations - they are much more challenging to treat.,-,. Hola, encantado de estar aquí. Sólo quería animarte más en su trabajo y le deseamos una buena escritura todo el tiempo. Lord Jesus Christ, Son of the Father, send now Your Spirit over the earth. Let the Holy Spirit live in the hearts of all nations, that they may be preserved from degeneration, disaster and war. May the Lady of All Nations, who once was Mary, be our Advocate. Amen." Please pray this prayer and spread the prayer to others. We can't agree on things simpler than this...It is amazing to me that the two sides can't sit down and invest in some common sense for the many young and old that will be killed by an illegal guns....just truly amazed! Bro.. do you think... seriously do you think the US government is exempt from becoming corrupt? Really, honestly? Dude WAKE UP! The history of the WORLD says the exact opposite! Guns are to protect us from the corrupt government. Sadly we think that we are exempt from this EVER happening in the US. Yes, its beyond tragic that people use guns now to kill the innocent and even worse little children, breaks and crushes my heart to no end... but that is not the answer to take away guns... seriously start with our entertainment first before anything. LETS STOP ALLOWING ENTERTAINMENT THAT HAS KILLING EH? Oh no don't take away my ENTERTAINMENT. Oh you don't think that entertainment is what the issue is huh? Well... look at how much people poor into advertising.. BILLIONS OF DOLLARS!! Why because they know it effects people, and so too does playing games that kill people and watching entertainment that kill people. The real slogan should be.... "GUNS DON'T KILL PEOPLE.. PEOPLE (who live in a world with killing all over in entertainment) KILL PEOPLE! Bro, put even 10 percent of your efforts, and all you other readers as well, just 10 percent of effort towards cutting down death in the media in entertainment form and you will do FAR MORE than by taking away guns from the people. VERY VERY VERY TRUE STATEMENT! He is wrong about what the bible says about being armed with the current weapon of the day, remember when the church officials came to arrest Jesus in the garden , the apostle Paul DREW HIS SWORD and cut a mans ear off, and what did Jesus say to him ,he didn`t reprimand him he said ,Stop there will be a time for the sword (GUN) but this is not it.So what can we learn from this , first the apostles carried weapons while in the company of Jesus, second, apparently Paul was very good with his sword, he obviously bested the guy whose ear he cut off. So after reading this i have no problem being a Christian and carrying a gun and using it for self defense , you attack me or my family and i`ll do more than take your ear off. TGuns don't kill people, but evil hearts do (and we know this is true). Then it follows that the way to reduce "people violence" ...notice I didn't say "gun violence" as guns themselves are not violent.... is to infuse hearts with love and care for their fellow man. And the way to do that is to spread God's word to every corner. Sadly, the United States of America has made that illegal. "And the way to do that is to spread God's word to every corner. Sadly, the United States of America has made that illegal." I know. As the right-wing Norwegian mass, Anders Breivik, murderer said: " reject Odinism, Thor's Hammer cannot unify the people of Europe, but the Christian cross will." And after all that Odin has done to make those countries so peaceful - just look what happens when He is rejected! Spread Odin's word to every corner for true peace! Yea.....I'd say America is pretty much going to hell in a hand basket. The rest of the world is looking at you wondering what the hell you guys are up to over there. Your kids are killing each other in their schools. You've got guns on every corner. Movie theaters aren't even safe. Sheesh. I've been a babptist, a presbyterian, an evangelical, an agnostic, a pagan, a wiccan and a skeptic. I am not a religion. I am a person. I am a person who has a religion...and sometimes not. If you give up your guns the predators will have them and you will not. Predator came to this planet with a gun on his shoulder. He does not need your gun. Your best bet is to set up an ambush area using spikes and logs, cover yourself in mud to lower the chance his thermal scanner will find you, then lure him into the ambush. Good luck! bahahahaha Thank you for that. I also plan to use that strategy in the upcoming zombie apocalypse. In which case, I will need my gun. It is wrong to kill but I am just as much against abortion as I am against anyone harming any person – we must protect all life and that means even in the womb. protect myself from those who already are. Who's "we" and who says "we must protect life in the womb"? You don't have any say over what's in anyone else's womb. Mind your own fvcking business. Evangelicals are as much a fanatical group as gun owners are. The scariest thing is mixing the two because when god tells them to do something they will come out shooting! Most of them are anti gun that I've met and don't realize that gun control is an angenda of conquerors. Absolute conquerors. I live in John Boehner's district in which most people wrap themselves up in the flag and hit people over the head with their Bibles. These people are MASSIVE hypocrites. Would Jesus be a member of the NRA? Would Jesus walk around packing heat? Would Jesus be teaching respond to violence with more violence? Of course not. But his alleged "believers" routinely tout God, Guns, and Country. They are great at judgment, hatred, and paranoia, but not so good at love. Maybe they should read their Bibles rather than just hit people with them. They are what Jesus would call whited sepulchers and blind guides. There is a nice money-changer-in-the Temple opportunity for them here though: WWJP bracelets. "What Would Jesus Pack?" Maybe Glock could sell these with every 9MM handgun sold. Remember: Don't trust God to protect your steps. Those Bible passages are all FALSE, right Christians? Buy that gun. It is much more reliable than some Deity that I only nominally believe in. I'm sorry, man. It must be difficult to accept that such a hypocrite is charged to represent your interests. In the south, Mexico removed the guns with laws. Violence raised. Unarmed guards at the schools. Children got killed. If sheep go to the slaughter . They get slaughtered. Only a person with a gun can stop a manic depressed crazed shooter. Maybe we should place armed unicorns at all the schools. With Mexico as a model of failure. Pull your head out of your southern region. ANTI GUN LAWS DO NOT WORK. Anti gun laws work perfectly in most all of Europe! We had over 11,000 gun deaths in 2012 while England had 37! The small numbers are the same all over Europe and Canada! How did the anti-gun laws work out for Europe back in the late thirties? The perpetrators of the violoence that is the reason wea re having this discussion re mostly desiring a degree of notice and fame. One journalist has it right. Do not report these incidents with such spectacle or sensationalism and never name the person(s) responsible. Let them live in jail or die in complete anonimity. Perhaps, then we would not be having this very dicussion, now.